TL;DR: The low quality of questions has been linked to decreased activity of users who have > 25k reputation. Improving question quality would benefit both ends. What would be the best ways to achieve it? Improving the quality of Stack Overflow questions has been discussed before. One suggested solution is addition of tag-tips. Other suggested solution is an addition of small barrier for new users before they can ask questions. One of the most interesting solution, is addition of machine learning heuristics to detect bad question right away. This is already implemented for bad answers. And there has been also contest to find an algorithm that predicts whether a question will be closed. Indeed there is also detailed analysis of closed questions. educate new community members about Q&A. Even though there are generally good guidelines. new Stack Overflow users don't find them either don't know how to apply them in specific area (tag). My idea: Community supported tag specific sample question which would show up for new users. Sample question would show up related to first tag and user could modify it or delete it. Tag-tips: More guided help to first time user. Machine learning heuristics to detect bad question before it is posted. Efficient way of using voting/flags and comments. Downvoting is actually quite effective method to force people to rethink their question and make it better. But it still requires manual work and active education of new users by asking same questions over and over again. Is there any other more efficient ways to improve quality? I don't think more guidance is a bad idea. I think there are several possible ways to go about improving question quality. I am posting them as separate suggestions so they can be individually vetted. Essentially more close reasons for questions from low reputation question askers. I know this may seem "elitist" but there is certainly data to suggest that low reputation users have questions closed at a much higher rate than that of higher reputation users. Furthermore, their posts are probably deleted at a higher rate but that data is not public so I could not provide it for analysis. Given this, it could be easier to distinguish questions which need to be closed if there were perhaps another 3-5 close reasons which only apply to users who are essentially learning the system. This would provide more granular feedback as well to them. Any feedback on what type of close reasons would work here, or if an expanded amount of reasons would help, is welcome. In addition to more reasons, this set could also face easier routes towards closure, perhaps less total votes required; such as maybe one less, as in 4. Also this could be paired with Brad Larson's idea (inspired by an MSE post) for a downvote trigger for closure. These metrics could make it easier to clean up questions quicker, and perhaps with the voting aspect, in a more automated fashion as opposed to manually having to pick and choose close reasons. Show the "on topic" checklist to users who have less than 111 reputation (basically new users and also takes into account users with the association bonus). The excerpt shown is taken from https://stackoverflow.com/help/on-topic . This would only be visible to users who have less than 111 reputation. I like the idea of tag based suggestions for the question asking screen. 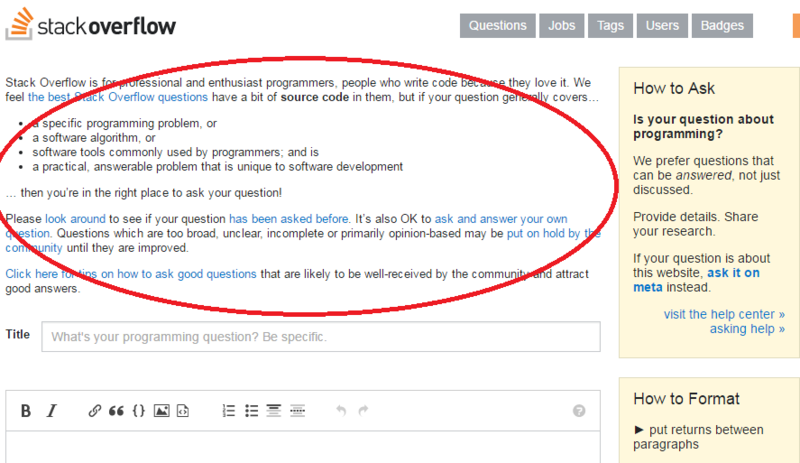 Have a section on question asking in the wiki interface which is maintained by the community. The tag with the largest amount of questions tagged in a question has its question asking section pegged to the right as suggested in your proposal here. I think that is a decent approach.